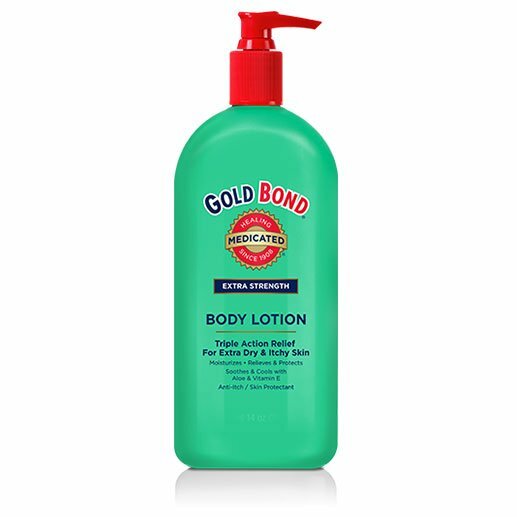 Gold Bond Medicated Extra Strength Body Lotion 14oz has been formulated to help you with any skin ailment you may have. Designed to support multiple kinds of skin ailments, Gold Bond skin care products can aid you with repairing, moisturizing, and calming your skin. ADW Diabetes offers a wide selection of Gold Bond skin creams, powders, and lotions in both single units and discounted bulk packs for your convenience. Gold Bond Medicated Extra Strength Body Lotion 14oz has five intensive moisturizers to protect and soothe irritated skin, while the powerful cooling sensation soothes the itch and relieves irritation. Perfect for minor skin irritations like insect bites or rashes caused by poison ivy, oak or sumac. Gold Bond Extra Strength Medicated Body Lotions goes way beyond ordinary body lotions because it is uniquely formulated to relieve the itch while moisturizing and protecting dry, chapped skin. So when you need extra itch relief, rub on Gold Bond Extra Strength Medicated Body Lotion. It does what it says. Rashes due to poison ivy, oak or sumac. Dimethicone 5% / Skin Protectant.